The Alabama Legislature passed “an Arizona bill with an Alabama twist” Thursday night, prompting one top attorney to call it “the strongest” illegal immigration law in the country. The House voted 67-29 and the Senate 25-7 in a compromise bill worked out by two Republican legislators who led the charge for the legislation, Rep. Micky Hammon of Decatur and Sen. Scott Beason of Gardendale. The bill now goes to Gov. Robert Bentley, a proponent of immigration legislation in the past. 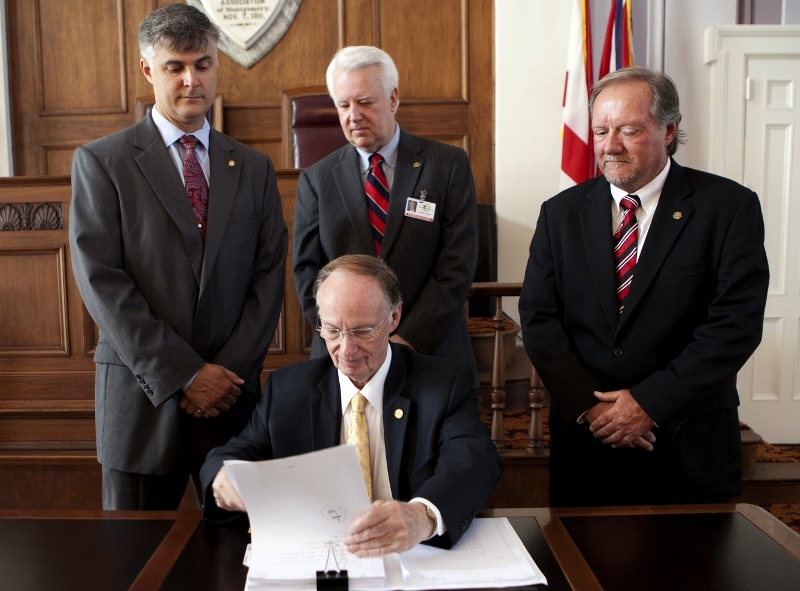 “This is an Arizona bill with an Alabama twist,” Hammon said. Like the Arizona law, the Alabama bill allows police officers who stop motorists for traffic violations to detain the violators if they have a “reasonable suspicion” the person is in the country illegally. The sponsors said that if the motorist doesn’t have a driver’s license or other document to show, the police officer will have to try to determine the identity by checking other records. They said “reasonable suspicion” could include acting nervously or having a tag that doesn’t match vehicle registration records. The bill requires businesses to use the federal E-Verify system to check to see if their new hires are legal residents. Businesses with 25 or fewer employees could use the state Department of Homeland Security to do the checks for them. Any business twice cited for hiring illegal workers could lose its business license. Beason said the checks would get rid of illegal workers that are taking jobs that should go to legal Alabama residents. “This is a jobs bill,” he said. The bill makes it a crime for an illegal immigrant to apply for a job and for anyone to transport or harbor illegal immigrants. It also prevents cities from passing laws to protect illegal immigrants in their cities. Sen. Clay Scofield and Rep. Kerry Rich, two-thirds of the Marshall County Legislative Delegation, had significant input as they served on the conference committees for the final version of the bill. Rich said the provision that has caused the most amount of controversy is the requirement for businesses to use E-Verify to determine the legal status of a new hire. Legislators debated whether the provision should be applied to all businesses or only those that contract with the state. Rich served on the conference committee to iron out the differences between the House and the Senate, and he said the compromise was businesses that contract with the state will be required to use E-Verify beginning Jan.1, 2012. All other businesses will have to use it beginning April 1, 2012. Proof of using E-Verify would be required before receiving any contract, grant or incentive with the state. “It’s also got an important enforcement provision where no one can receive any appropriation from the state if they’re not enforcing the law,” Rich said. Under the bill, if businesses contracting with the state violate the provision, consequences would include up to 60 days suspension of the business license and three year’s probation for the first offense. Upon second offense, the business could permanently lose its license in the location of the business. Other businesses that do not contract with the state would suffer similar consequences with a 10-day suspension on the first offense, permanent revocation of licenses in the area of the business on second offense and permanent revocation of licenses throughout the state on the third offense. “Obviously, it gets tougher with each time,” Rich said. In addition, the bill would prohibit businesses from using wages or compensation for services provided by an unauthorized alien as a tax deduction, as well as the practice of failing to hire or fire a legal resident while keeping or hiring an illegal resident. It would also make it a Class C misdemeanor for an illegal resident to apply for, solicit or perform work. Illegal aliens would not be able to receive welfare benefits under the bill, although it does not prohibit illegal immigrants from receiving assistance via WIC, a supplemental nutrition program for women, infants and children. “One grain left in there that I wanted out was WIC, but they argued that federal law requires that we provide WIC,” Rich said. • Requiring public schools to determine the legal status of enrollees and annually submit data to the State Department of Education, which will then release a public report on the cost of providing education to illegal aliens. Democratic Sen. Linda Coleman, of Birmingham, predicted the law would lead to discrimination.